Literally, it has to to with not beeing connected to devices or computer for a period of time daily – or for several days – weeks depending on your circumstances. Another definition, recently pointed out to me by a coaching client, is to release all toxic people and past negativity-shame from your life to reconnect with your joyful, peaceful inner self-child and be mindful/present in each waking moment. “SOAR! with Resilience” on Amazon! Yay! After spending several hours (yes, I persevered!) on the website, and several calls to the help desk- you may find my spiral bound interactive book for overcoming obstacles and achieving success formatted and illustrated by James Rutnam of webtimegraphics.com and motivationalwhisperers.com. Now I’m working on uploading the digital-kindle version. check it out: http://www.amazon.com/gp/product/0615341810 . 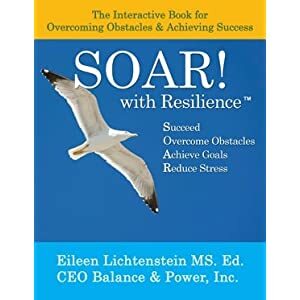 Dawn Abraham, CEO of motivationalwhisperers.com comments: ” Eileen’s interactive book is both enlightening and motivating. Eileen truly partners with you as your Peak Performance Success Coach as she takes you step-by-step through her process of achieving success.” Thanks, Dawn! This powerful interactive book will change your life! At last there is a book that interactively takes you through all the components of success. Eileen Lichtenstein waves a wand of magic with this inspirational book & it will leave you spell bound! A must read for anyone struggling to take their personal or professional life to a higher level of success and satisfaction. Eileen has created a book where she is “your” business, life, parenting or transition coach – partner! Eileen takes you through her personal journey of accomplishment while showing how you too can achieve the same peace and balance she has achieved in her own life. Her inspiring book gives you real life examples of how she guides her clients to success through her own experiences and years of training as a successful life and spiritual coach. As if that’s not enough, this amazing book is chock full of inspirational quotes from some of the top self help guru’s of our time. Eileen’s interactive exercises that are sprinkled throughout the book are delightfully easy to follow while guiding you step by step through her process to success. Eileen made sure she left no stone unturned in the area of dealing with stress. She gives you several very effective techniques to deal with stress in your life. What You Will Gain: * Increased Self Confidence * Peace of Mind * Balance * Higher Income Potential * A Feeling of Well Being and Improved Health * A Better Understanding of Your True Capabilities Don’t wait to start turning your ailing business – or life – around. Be proactive: If you’re doing well, SOAR! will propel you to a higher level of success and happiness! Thinking about becoming an entrepreneur? Looking for a career change, a reinvention? And if you are simply feeling overwhelmed with life, “sandwich generation” or parenting issues, this book will help get you get unstuck, be fearless and SOAR! I’m so happy that I have my printed published book: SOAR! (TM) with Resilience, powerpoints and myself to focus my “reportoire” with in person workshops and teleclasses. http:www.balanceandpower.com/events and Book link. Looking forward to facilitating Mastermind telephone groups and in person series including EFT and MBSR in my renovated home space! (we had a flood in the “basement- former Dance & Exercise Studio and this is the upside- a renovation that insurance pays for :).